When our attack needed a real man’s man, there was only one player to call. 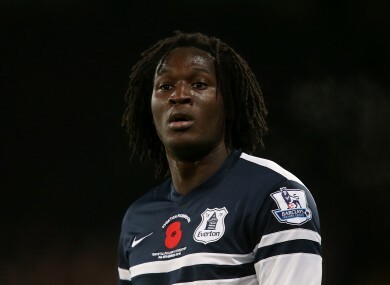 Romelu Lukaku -- Godfrey's latest fantasy signing. THE PREMIER LEAGUE is back and with it, a much-needed fix of Fantasy Football. Watching the World Cup play-offs during the week, I didn’t know who to shout for — the lack of gameweeks, free transfers and points to be won made watching international football an upsetting and confusing experience. However, quicker than you can say Ricky van Wolfswinkel, the Premier League has made its return, much to the delight of this canine. Its brief sabbatical also gave me some much-needed time to reflect on where it had all gone so wrong this season. Why was I sitting in only 519th position in TheScore.ie’s Joy Division despite my Harry Redknapp-esque inside-out knowledge of the game? Patently, as I cast a hard glance at the players that failed me, there was one individual who needed to leave faster than Adrian Mutu after an ill-judged photoshop. After all, this is the Premier League, i.e. no place for fancy, tiki-taka-flaunting Spanish strikers. With that in mind, we’ve brought in the best ‘good-feet-for-a-big-man’ striker to have been unearthed since a young Peter Crouch dazzled us all with his whole standing-in-the-penalty-area-and-waiting-for-the-ball-to-be-thumped-in-his-general-direction shtick. Yes folks, when I consulted my crystal ball and enquired as to what drastic actions needed to be implemented to revive the flagging fortunes of my poor fantasy team, he had me at Romelu Lukaku. With the silky skills of Luis Suarez and Olivier Giroud already secured, it was obvious a bit of brute strength was required to complement the more subtle talents of the rest of my squad. Of course, I committed the classic fantasy schoolboy error of checking who Lukaku’s team were playing only after putting him in my side. Let’s just say this canine is hoping Brendan Rodgers doesn’t give his side any more inspirational names-in-envelopes-style speeches ahead of this week’s Merseyside derby. Email “Diary of a Fantasy Gaffer: Good riddance Soldado, hello Lukaku! ”. Feedback on “Diary of a Fantasy Gaffer: Good riddance Soldado, hello Lukaku! ”.